vacancies. Interested women candidates willing to work at Anganwadi may log on to the official website http://anganwadirecruit.kar.nic.in. Search for desired jobs and submit the applications with complete details through online before 18-02-2019. Candidates should have age limit between 18 years to 35 years. Selection for this 131 Anganwadi Worker/ Helper jobs is based on candidate qualification marks/ experience/ reservation. 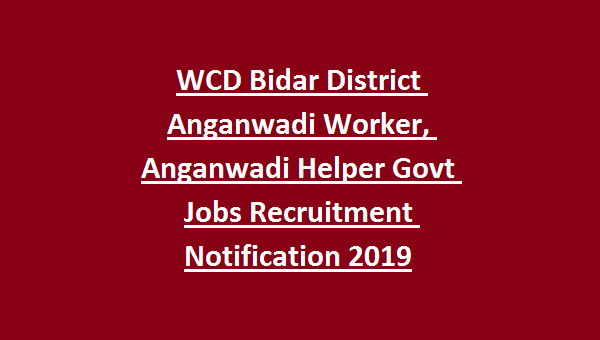 Full details regarding application procedure, selection process, age criteria, salary, Educational qualifications of Women & Child Development Department WCD, Bidar District Anganwadi Worker/ Helper Jobs Recruitment are mentioned below. Name and No of vacancies available in WCD Bidar District Recruitment are given below. 1. Anganwadi Workers: 30 posts. 2. Anganwadi Helpers: 101 posts. Qualifications required for Anganwadi Workers is SSLC/ 10th class pass. Qualifications required for Anganwadi Helpers is Minimum 4th standard pass and higher 9th class pass. See the Bidar WCD Notification for detailed qualifications. Minimum age is 18 years and maximum age is 35 years. See the WCD Bidar District Notification for Salary details. 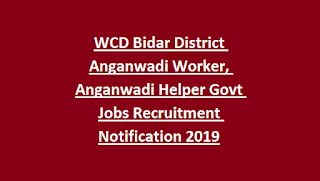 Selection of candidates for Bidar WCD Anganwadi Worker/ Helper Jobs recruitment will be depends on their educational qualifications/ Experience/ Reservation. Please check the WCD Bidar Notification for marks weightage. Eligible women candidates may go through the official website http://anganwadirecruit.kar.nic.in and apply for desired Anganwadi jobs. Fill the application with complete details. Upload with attested documents before 18-02-2019.